After already doing an exclusive preview of Psytronik Software's arcade like game ' Honey Bee ', you'd probably think I was going to take a time out with a hot cup of coffee. Well that didn't happen, as here I am with a review, and again it's a Psytronik Software release. This one is called ' Eye of the Gods ' and is an action platformer with you in control of a mighty hero, to infiltrate the ancient ruins of the Cradle of Civilization and to find the Eye of the Gods, to save humanity from its own extinction. As you probably remember from my previous exclusive, I did mention the fact that the music was done by none other than Richard Bayliss. Well once again, he's also gone and done the music for this game, so that in my book is a huge plus. More so if you've got a set of speakers that you can turn up, and dance to a retro beat while the game is either loading up or during the game it self. So what about the game and does it suffer as much as the previous one, well let me be honest no, it doesn't. If anything I actually enjoyed this game more so than the other one. Especially as it's more action oriented with lots more scenes to visit and enemies to blast! 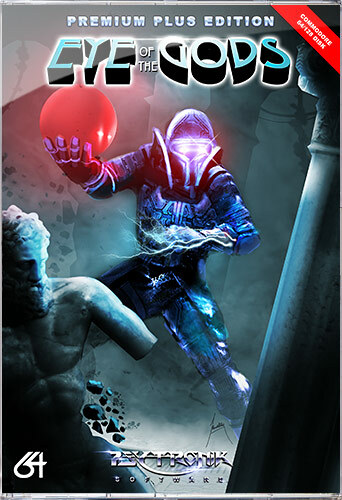 In this game you control a giant blue man that must traverse the multiple levels, to gather different power ups to reach the Eye of the Gods. This is done by either falling or jumping to get to a number of platforms or scenes and reaching each giant orb that looks to be held by Zeus him self. Once you get a power up, your suit of armour is given certain abilities, such as weaponry or under water power, that if you don't have, will cause your man to drown at a rather rapid rate. It is just a shame one such power up wasn't the ability to crouch, as some of the enemies can be rather annoying to deal with later in the game, and jumping isn't always an option. Other than the power ups which add a unique element to Eye of the Gods, I also liked many of the different scenes which really give that ancient civilization look. Although I do feel the main designer could've gone much further and really pushed the detail higher than it currently is. In all this is a really nice game with very few negatives, that I highly recommend others to pick up and play! So head on over to the main website (HERE) and buy it on C64 Disk or Tape with a rather lovely cover.